The new teen drama-fantaseye of ABS-CBN entitled “Little Champ” is scheduled to air this coming Monday (March 18) which will be starred by the newest Kapamilya child wonder JB Agustin and the first teleserye of the king of action Lito Lapid. According to Lapid, he got excited on the concept of the story because of the horse, “Ito kasi merong fantasy, may nagsasalitang kabayo, may comedy, may drama, at napakagaling ni Caloy, ‘yung bata. Ang galing niyang umarte,” said the actor. From the direction of Richard Arellano, Dondon Santos, and Mervyn Brondial, the story of Little Champ will revolve on the simple life of Caloy, his parents Lucas (Jhong Hilario) and Helen (Precious Lara Quigaman), and Chalk (a horse where Caloy is taking care of). When the son of the rich Miguel (Jake Roxas) has died when it accidentally fell down while riding the horse with his friend Caloy, the latter will be accused by Miguel. To get away from the wrath of Miguel, Caloy and Chalk will be headed to the place of Leon Del Torro (Lito Lapid) who is a barangay captain. There will be fights between the good and the bad forces when a meteor falls from the sky which will give power to Chalk and Caloy. Because of this, Chalk (the horse) will have a power to speak and Caloy (who always have illnesses) will have an extra-ordinary strength which he will use to revenge. Aside from JB and Lapid, the fantaserye will be also starred by Mickey Ferriols, Coleen Garcia, Renz Fernandez, Alex Calleja, Paolo Serrano, Katya Santos, Ruben Gonzaga, and Sofia Millares, with the special participation of Jolo Revilla. 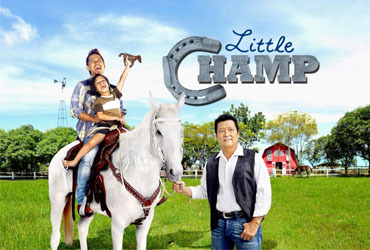 Little Champ will air from Monday to Friday before the TV Patrol in ABS-CBN.